Somewhere along the east coast of Africa, pirates have attacked a luxury yacht! They have taken a few seemingly wealthy passengers as their hostages, a family and an old man, hoping to collect a hefty ransom for each of them. When the hostage negotiations go awry, the rescue duties land on the weak shoulders of an unlikely hero. 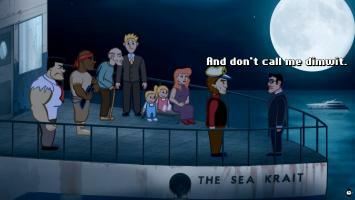 Little does he know that the ship's crew, that stands in his way, is composed of some very weird and silly individuals. Features - The first 1280x720 resolution AGS game? - 18 wacky characters! - 15 rooms to explore! - Lots of lazily made animations! - Bingo! - Karaoke! - An inflatable lady! - Hitting bad guys with a cane! "A solid adventure game given lots of care and attention, fun mechanics and interesting characters. Quirky and enjoyable, excellent production value and fun music and sounds." Finally got the time to play this game, and it turned out to be a real gem! The graphics/animations are wonderful, and I especially liked that you can include the room-hotspots into the dialogues. The story is well done, too! The puzzle with the three brothers was my favourite. Top game! I loved it. Wonderful game with a great sense of humour! I don't agree with the comment about profanity here, I think it made it feel better... but I swear like a sailor myself. He was supposed to be British (I guess, by the money in his pocket!) and we don't get our knickers in a twist over swearing so much. I think it added to the "colourfulness" of an eccentric old man, who doesn't stick to the rules of the norm and I liked that. Also, it's one of the up sides of a non-commercial game, if you don't have censors to please and certificates to adhere to, you can say what you like, and that makes Indie games more interesting in some ways- freedom of speech. I also headed for walkthrough once or twice, but mainly it felt very intuitive and I think if I'd pushed for long enough I'd have worked most f them out eventually. Extra thumbs up for Barbara and the connection they made there <3 I can imagine if there was ever a sequel, he'd need Barbara to be in it too! AND Herr Hindenberg made me giggle too. Some of the puzzles and jokes felt very reminiscent of Monkey Island or Leisure Suit Larry, and that is a very good thing. I'll be looking out for more games by the same people!! THANK YOU. Even with good graphics and ingenious sailing mood, dialogue centric gameplay is really ruining point'n click nature. I got really bored of continuous interviewing, perhaps I'm not a journalist type. some puzzles sent me to the walktrough! Brilliant Game, Beautiful artwork and enjoyable challenging puzzles. Now that it is free there is no excuse whatsoever to not play it! The visual style was quirky and enjoyable, good music, funny characters and good writing. What I especially enjoyed were the puzzles - very well designed and quite diverse. They were also nicely balanced - had to get my thinking hat on a few times but never needed to resort to asking for a hint. The karaoke puzzle was pure genius! The only thing I wasn't keen on was the use of profanity which felt very unnecessary. Overall this was a fine adventure game, a nice length and good challenge.